Amy has a desire to help others reach their personal health and fitness goals. She has always had a passion for fitness but decided to turn her hobby into a career. Her goal is to motivate and encourage others towards more positive, healthy & active lifestyle through physical fitness. For the last 15 years, Amy has been AFFA certified. She teaches Kickboxing , Abs, Boot Camp, and Muscle Conditioning classes. 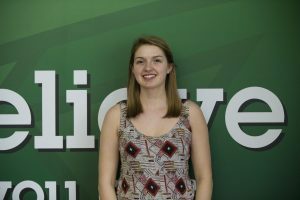 Amy hopes to continue a career of helping others become healthy and physically fit. Bonita first started teaching group fitness when she was 22 years old teaching a variety of classes from Spin to Yoga and everything in-between. Bonita holds a BS degree in Cardio-Pulmonary Sciences, is Group Certified with American Council on Exercise (ACE), and is a 500HR Registered Yoga Teacher with Yoga Alliance. Bonita also is a certified Health Coach with the Institute of Integrative Nutrition and a Reiki Master Teacher. Bonita’s combines her medical knowledge, western tradition of fitness, and eastern tradition together to provide a safe, fun and balanced class. 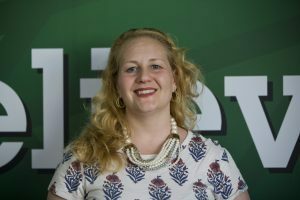 Chrissy is currently a Grade 4 Elementary Educator with a Bachelor’s Degree in Elementary Education and a Master’s Degree in Special Education. She has been teaching students in Warwick for 28 years. She is married to David and has two wonderful boys, Evan and Joshua. Their black labrador, Gracie, keeps them all very active! She is also an ACE certified Group Fitness Instructor who has been teaching for 19 years. 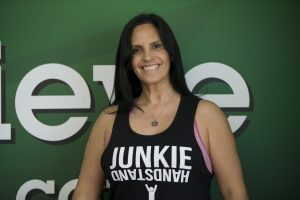 Throughout her fitness career, she has taught various formats such as circuits, boot camp, weight classes, yoga, pilates, kickboxing, step, stability ball, and body bar. Instructing members in Trekking, Spinning, Zumba, and Gravity are some of her other favorite formats as well! She has experience with large and small group training. 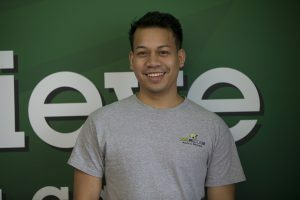 She regularly attends workshops, certifications and conferences to keep her skills updated and to assist members interested in maintaining or improving their fitness level. Teaching, coaching and working with others who want to make a difference in their lives is in her blood! Chrissy lives by the words of Mahatma Gandhi, “You must be the change you wish to see in the world.” She is here to have fun with members while staying healthy! Danielle received her MS in Health Care Administration at UNH and her BS in Public Health Care. 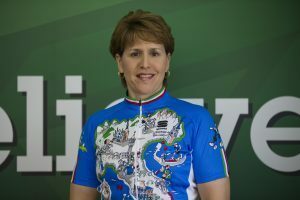 She has been active in sports and fitness all her life. She played softball, tennis, volleyball and basketball in high school and went on to play tennis in college. She has a successful 26 year career in Pharmaceutical sales as an Institutional Specialist. 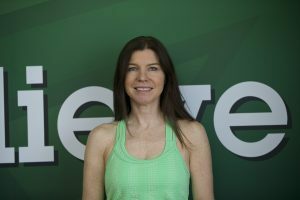 She has been a fitness instructor for 18 years and loves teaching sculpt, step, spin and strength training. She believes that anyone can improve their fitness level no matter what their physical condition may be. 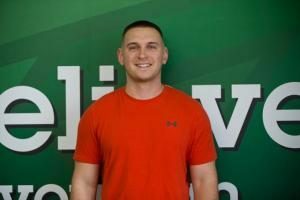 Danielle feels that work outs that are functional and complement your lifestyle will make daily life more enjoyable and will improve your quality of life. She enjoys making workouts interesting and challenging so that her clients are having fun while staying interested and focused. What inspires me most: Inspiring someone else… Making a difference in someone else’s life! She is very excited to be teaching at ProFitness! 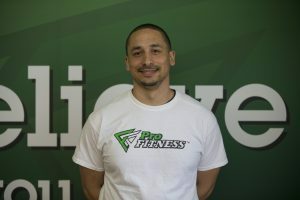 Diane Macera is an AFAA certified personal and group fitness trainer. She is also certified in TRX, Indoor Cycling, PiYO and Tabata Bootcamp. 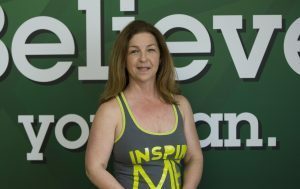 Diane entered the fitness industry on a full-time basis a few years ago after closing her home daycare, which she ran for 20 years. 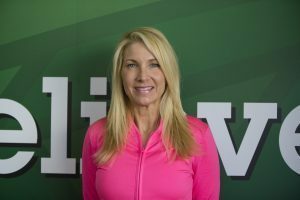 Fitness/wellness has always been a passion of Diane’s and she works to motivate her clients to find a workout routine that they enjoy. 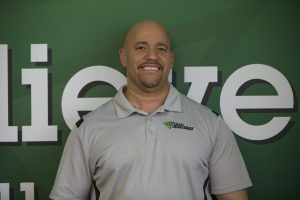 She has found that group fitness classes/activities allow clients to feel a sense of comraderie and support while at the same time holding them accountable. She encourages her clients to look beyond the mirror and the scale and to find their inner beauty by feeling good about themselves. Jeannine took her first yoga class in a gym setting in 2010. She quickly found out that what did not kill her, not only made her stronger, but also more flexible, and more content within herself. She found that yoga awakened in her something that she did not know was there. It was little more than a year after that that she embarked upon her 200hr YTT with Coral Brown and Debbie Valois. The training was in the style of Prana Flow, a rhythmic moving vinyasa style of yoga developed by Shiva Rea where the class tends to culminate in a ”peak pose”. Jeannine first began teaching in 2012 (at Profitness) and has continued to develop her yoga education and teaching skills with her 500hr YTT (in Prana Flow with Coral Brown) and a number of continuing education workshops in many various aspects of yoga (including alignment, assists, mudras, and adaptive yoga). In the fall of 2014, Jeannine travelled to Rishikesh, India for a 12-day immersion into the culture of yoga in that region. It was a life changing adventure! 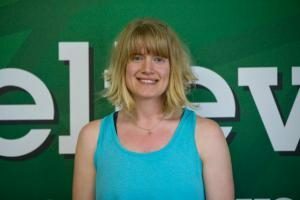 Jeannine believes that yoga is for EVERYONE and encourages anyone new to yoga to feel free to join her class. Her classes are a combination of strength building, core, flexibility, alignment and stress release. Being a Vinyasa class, you will experience flowing from one pose to another. But, there is also time to pause in the poses, to feel the energetic alignment, slow down the breath, and release and let go. You do what you can, and modify as needed. Jeannine offers a variety of options in her class, and wants her students to know that they have the freedom to make choices in her class. She hopes that when class is done, her students feel complete and at ease and ready for whatever their life holds. Kate began dance classes at the age of 2 and continued throughout college. 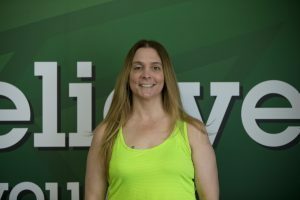 Always interested in physical activity, she started taking various fitness classes and became a regular at the gym, constantly asking the front desk when they would add a dance fitness class to the schedule. One day they mentioned they were adding a new class: Zumba. Within 2 minutes Kate was hooked. She began training with the Group Fitness Director, Tricia Kennedy Nikodem, and was certified within a few months. For the past 6 years Kate has been teaching Zumba, Dance Jam, Interval and Total Body Training classes. Kate has her group primary fitness certification through Aerobics Fitness Association of America (AFAA). She is also certified in Zumba, BodyStep and YogaFit certifed. In her spare time Kate can be found enjoying the outdoors, working out or doing art and design projects. Lisa has always been a fitness fanatic. She joined the gym and began taking classes at Profitness several years ago. After taking her first spin class she was hooked. 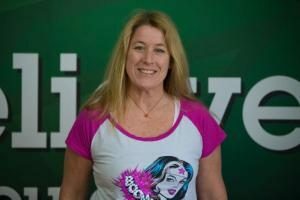 Lisa is full of energy and, in 2012, she began training with the Group Fitness Director, Tricia Kennedy Nikodem. The following year, 2013, she became a certified Spin instructor through Mad Dogg Athletics. She has been teaching Spin ever since. Lisa also enjoys teaching weight training and interval classes as well. She is working toward obtaining her primary group certification through Aerobics Fitness Association of America (AFAA). She enjoys learning about new fitness trends, motivating members, keeping them sweating and most of all having fun. When she is not teaching class you may find her sitting in her car rocking out while working on creating a great music playlist for her next class. Lynn is a “Madd Dog” certified spin instructor as well as CPR certified. She has been a health and fitness enthusiast for over 25 years. 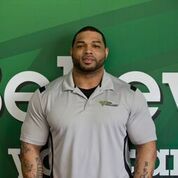 She truly enjoys working with people that are new to the gym and looking for a fresh start. She currently enjoys spinning, running, group training, weight lifting, and core strengthening training. For fun she enjoys participating in Spartan and other running/obstacle type races. 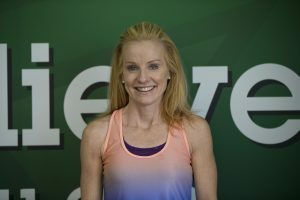 Melissa started teaching Group Exercise back in 1985, certified through the American Council on Exercise (ACE) and eventually became a CEU provider for them. 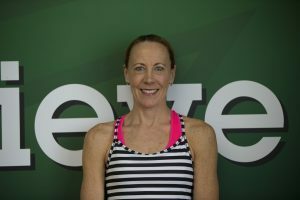 After starting pilates in 1994, Melissa found STOTT PILATES® in 1998, and trained at the Northeast Pilates Certification Centers in MA. She was invited into the Instructor Training program, and became one of the elite cadre of STOTT PILATES™ Instructor Trainers in 2003. Completing her IT training in Toronto, Canada Melissa is a STOTT PILATES IT for Mat, Reformer, CCB, SPX and ISP. 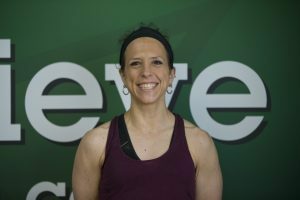 An American College of Sports Medicine certified Personal Trainer, Melissa is also certified in Group Cycle, YogaFit, Zumba®, Yamuna® Body Rolling, TRX® and holds belts in Krav Maga, Budokon and MMA. Melissa graduated from the University of RI with a BS in Human Sciences, and from Bryant University with an MBA. 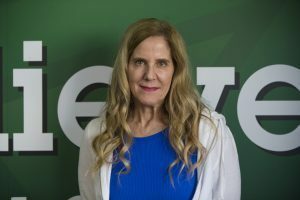 She holds professional certifications from the American Society for Training & Development, Seton Hall School of Law’s Pharmaceutical & Medical Device Healthcare Compliance program, the Healthcare Compliance Association and Dale Carnegie Training. She was a Physical Therapy Assistant, a licensed EMT and she trains groups in CPR and First Aid. Melissa teaches: Cycle, HIIT, Shred, Chisel, Cardio KickBoxing, Pilates, Yoga, Bootcamp, Aerobics, Step, TRX, Kettlebells, Foam Roller, Functional Training and Athletic Conditioning. Nicole has trained in several areas of health and fitness. 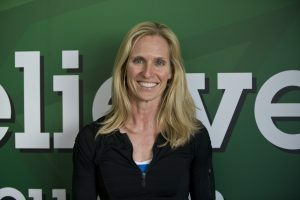 She is a registered nurse, first degree black belt, outdoor cyclist, OCR enthusiast, and certified group fitness trainer. Nicole is a firm believer in paying it forward. She is passionate about not only sharing the experiences and skills that she has learned, but also helping to motivate others to reach their highest potential and personal goals. Nicole is AFFA Certified in group exercise, MAD DOGG Certified Spinning instructor, and Tae Kwon Do instructor. Tracy has been teaching group exercise for over 10 years. She teaches spin and a variety of sculpting and cardio classes. She is certified through the Aerobics Fitness Association of America (AFAA) and Mad DOGG Athletics. Tracy is passionate about inspiring and motivating people. She loves to design creative and challenging workouts that push people to their full potential as they reach their fitness goals. Jodi has worked in the fitness industry for the past twenty years. 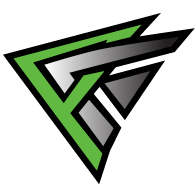 She holds Group Fitness and Personal Training certificates from AFAA. Jodi also holds certificates in Spin, TRX and is also a Yoga Fit Level one instructor.